Broken blood vessels are a part of life that many people have to deal with as they age. The technical term for these broken blood vessels on the face is telangiectasia rosacea and it can be hereditary. In their simplest form, broken blood vessels on the face, or anywhere else on your body, are tiny capillaries close to the surface of the skin that break after dilating from too much. Unfortunately, once broken blood vessels appear, it may be very difficult to get rid of them. These broken capillaries make the face look like it is slightly bruised and cause you to look older than you really are. Because these blood vessels are so thin, they are very easy to break. Broken blood vessels on the face can be caused by scrubbing the face too hard or from rinsing the face with excessively hot water. Excessive sun damage may also cause broken capillaries and lead to unsightly red spots on face. Pregnancy and childbirth are also associated with broken blood vessels on face, due to increased blood pressure. Some birth control pills will also cause blood vessels to break as well as some oestrogen therapies. Age contributes to the likelihood of getting broken blood vessels on face, because as we get older, our body becomes more prone to damage. Decades of sun exposure without proper sun screen, poor diet and declining health all affect the body’s ability to regenerate itself, and capillaries become weaker in the process. Broken blood vessels on face can also be caused by the consumption of too much alcohol, because alcohol increases blood pressure, causing veins to dilate. This is especially detrimental over the long term. When the capillaries dilate repeatedly, they eventually lose their ability to contract. Eventually, they show up as broken blood vessels on face or other parts of the body. While it is not possible to completely avoid broken blood vessels, there are several ways to minimize the risk. The first way to avoid breaking capillaries is to wash your face lightly with warm water, not hot water. Secondly, stay out of the sun or apply sunscreen, especially to the cheeks and around the eyes where capillaries are more likely to break. Other steps to prevent broken blood vessels on face include limiting alcohol consumption and eliminating hot showers or baths. Many people think that they only need to be careful with the water temperature when they are using a facial cleanser during their skin care routine, but completely forget about their time in the shower. If your showers tend to be with very hot water, then the combination of water and hot steam may also cause damage over the long term, as they force capillaries to expand. 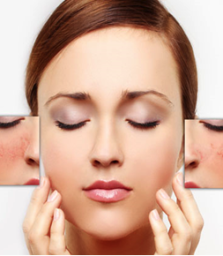 Fortunately, there are treatments that will reduce the signs of broken blood vessels on face. One of the most common treatments is with lasers. This type of treatment works when the skin absorbs the light from the laser and destroys the capillaries. The capillaries do not disappear immediately, but are absorbed and dismantled by the body. We offer a world-renowned non-surgical treatment to combat Facial Blood Vessels (also known as telangiectasia) and Broken Capillaries. Cutera’s proprietary Coolglide ND-Yag Laser is known amongst the industry leaders to be the most effective vascular laser. Broken vessels are treated so effectively it is as easy as “now you see it, now you don’t”! Book a Consultation with our Aesthetic Surgeon to find out more about this amazing treatment.